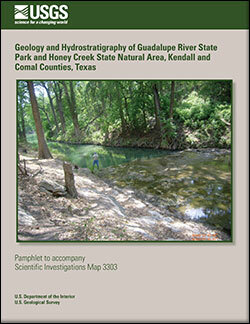 Hydrogeologic mapping and descriptions of the lithostratigraphy and hydrostratigraphy of Guadalupe River State Park and Honey Creek State Natural Area, Kendall and Comal Counties, Texas, are presented in this first detailed 1:24,000 geologic map, along with proposed names and descriptions of the hydrostratigraphic units in the study area. Variations in the amount and type of porosity of the lithostratigraphic unit, which vary depending on the depositional environment, lithology, structural history and diagenesis support the resulting hydrostratigraphy proposed herein. Rocks exposed in the study area consist of Early Cretaceous sedimentary rocks that are assigned to the Trinity Group. The lithostratigraphy includes the Hammett Shale, Cow Creek Limestone, Hensell Sand Members of the Pearsall Formation, and the lower member of the Glen Rose Limestone. These lithologic units contain shale, grainstone, sandstone, and fossiliferous limestone, alternating and interfingering with mudstone, wackestone, packstone, and grainstone. The Trinity aquifer hydrostratigraphic units shown on the map and described herein are characterized by their porosity types. Porosity types were first determined from an analysis of two boreholes conducted in comparison with 143 geophysical logs from northern Bexar County, Texas. The cores and geophysical log comparison resulted in division of the lower member of the Glen Rose Limestone into six hydrostratigraphic units, designated A through F. Of those six units, only three remain in the study area because of erosion. The proposed naming of these three hydrostratigraphic units is based on topographic or historical features that occur in the outcrop area of those units. Hydrostratigraphic units that correlate with the boundaries of the formation have been given formational names excluding the lithologic modifier. The Doeppenschmidt hydrostratigraphic unit is stratigraphically the highest interval in the study area, characterized by interparticle, moldic, burrowed, bedding plane, fracture, and cave porosity. The underlying Rust hydrostratigraphic unit appears to be a confining unit with springs/seeps issuing near the contact with the overlying Doeppenschmidt unit. The Rust unit has interparticle, fracture, and cave porosity with cave porosity primarily associated with faulting. The Honey Creek hydrostratigraphic unit is an aquifer in the subsurface and exhibits extremely, well developed porosity and permeability including— interparticle, moldic, burrowed, bedding plane, fracture, channel, and cave porosity. This unit is named for Honey Creek Cave, which discharges water into Honey Creek. The Hensell hydrostratigraphic unit contains primarily interparticle porosity, but also exhibits some moldic and cave porosity in its upper parts. The Cow Creek hydrostratigraphic unit contains interparticle, moldic, vug, burrowed, fracture, bedding plane, channel, and cave porosity. The Cow Creek hydrostratigraphic unit is an aquifer in the subsurface and is the primary target for water-well drillers in the area. The Hammett hydrostratigraphic unit is not exposed in the study area but is thought to underlie parts of the Guadalupe River, based on mapping of the overlying units and comparisons with subsurface thicknesses obtained from the geophysical log. The Hammett unit restricts the downward migration of groundwater, resulting in springs that discharge at the base of the Cow Creek unit. These springs also create some base flow to the Guadalupe River during periods of extreme drought. The faulting and fracturing in the study area are part of the Miocene Balcones Fault Zone, which is an extensional system of faults that generally trend southwest to northeast in south-central Texas. An igneous dike, containing aphanitic texture, cuts through the center of the study area near the confluence of Honey Creek and the Guadalupe River. The dike penetrates the Cow Creek Limestone and the lower part of the Hensell Sand, which outcrops at three locations. Clark, A.K., Blome, C.D., and Morris, R.R., 2014, Geology and hydrostratigraphy of Guadalupe River State Park and Honey Creek State Natural Area, Kendall and Comal Counties, Texas: U.S. Geological Survey Scientific Investigations Map 3303, 8 p., 1 sheet, scale 1:24,000, http://dx.doi.org/10.3133/sim3303.